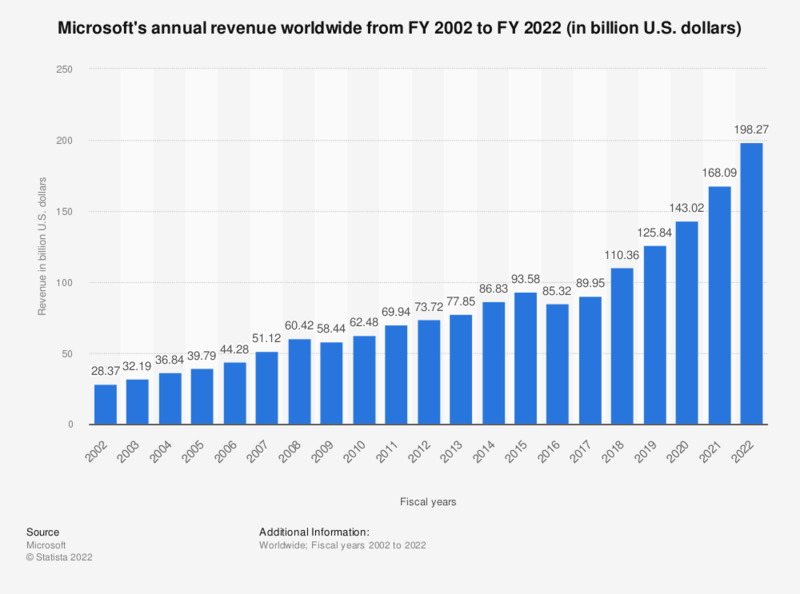 This statistic shows Microsoft's global revenue figures from the 2002 fiscal year to the 2018 fiscal year. In 2018, Microsoft generated 110.36 billion U.S. dollars in revenue, a record year in terms of revenue for the company. Microsoft has become a constant figure among the world’s most valuable brands. Its founder Bill Gates is presently, and perhaps unsurprisingly, one of the richest men in the United States and among the richest billionaires worldwide, among other well-known figures such as Warren Buffet, Carlos Slim Helu, and Larry Ellison. In addition to his status as an entrepreneur, Bill Gates is also known for his philanthropy. In 2000, together with his wife, they created the Bill and Melinda Gates Foundation. The foundation has donated a considerable amount of money, in particular in the area of research and development of treatments for neglected diseases. While Bill Gates no longer heads the Microsoft Corporation, the company itself continues to show extremely strong results around the world, with versions of its most famous product, the Windows operating system, consistently leading the home operating system market. The Microsoft Office suite also remains the most widely used office software around the world with few comparable competitors in sight. Microsoft's fiscal year ends on June 30 of the respective year.